At first I was hesitant about a place that made only pancakes and pizzas. Pancakes, sure. Pizza, sure. but both pancakes and pizza under the same roof? This was either going to be very good or very bad. Luckily its about 10am and I won’t be ordering pizza here today. Rarely do I get to eat breakfast, and even if I do, its rarely before 12noon. Its a shame because I love breakfast and most places stop serving it and start gearing up for the lunch crowd after 11am. Today I was up early and out early by 10am. Nearly never does this ever happen with the lifestyle I have. But now I am ready for a good hearty breakfast because I am about to head to the airport to sit for 3 hours, then fly another 5 and maybe, if I am lucky, I will get to eat again once I land and get home after 9pm. I dare not eat (much less pay for) any airline food, so I am going into this as if its my last breakfast for awhile, and it will be. While I love pancakes, Dutch pancakes are my favorite. They are thinner but have a lot more flavor and a wonderful char that just adds to this hard-to-find breakfast treat. 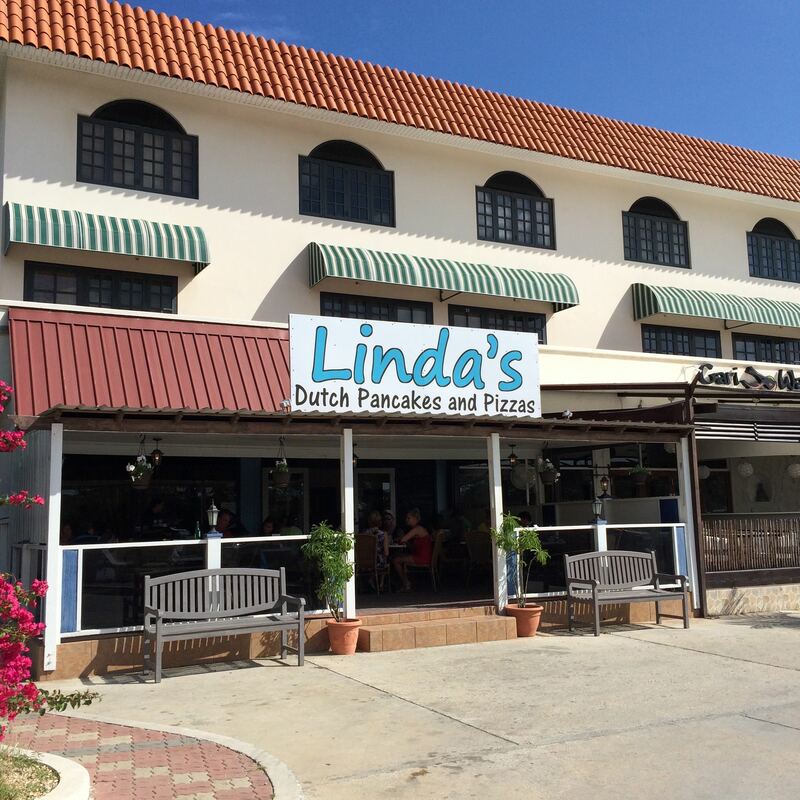 Linda’s has several varieties, but I wanted the very first one I ever tried at one of Iron Chef Competitor Scott Campbell’s restaurant called Avenue Bistro closer to 15 years ago. So, I ordered the Apple with Rum Soaked Raisins and dusted with confectioner’s sugar. Delicious. Not sure why they serve it with butter, because it certainly does not need it. 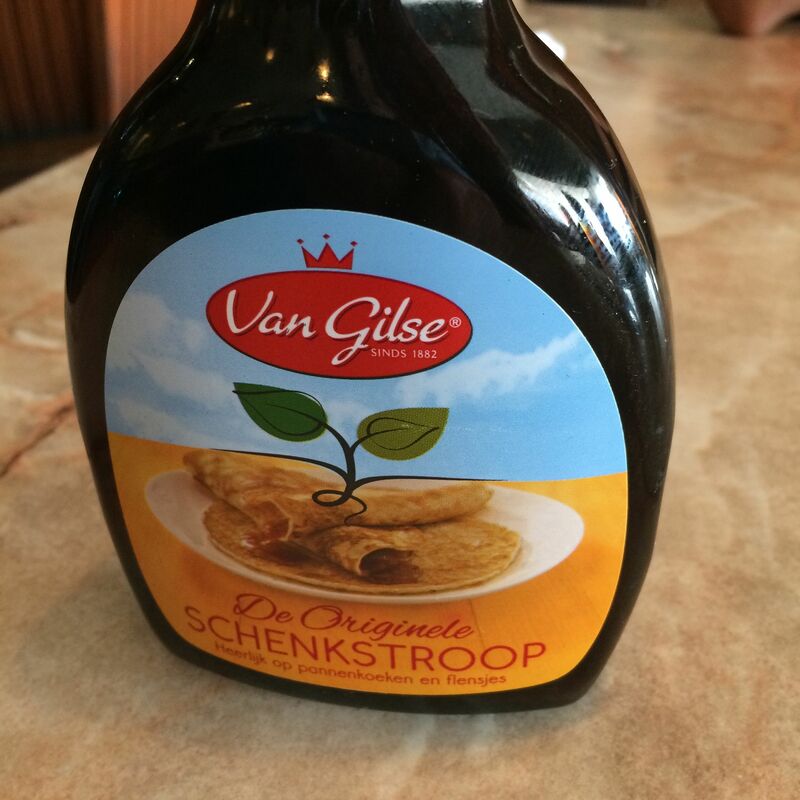 I did try it with the Dutch syrup on the table which is more like molasses than anything, but again, this did not need it. My girlfriend was a bit more ambitious, she ordered the brie cheese with walnuts and honey. I love brie, but not sure I would want it on a pancake. As it turns out, this was even more delicious than mine. In fact, I only finished half of mine then started eating hers. She had no idea they were so large, so with her side of eggs and bacon, she only ate about a third of it. Certainly one can serve two people, and I saw many putting them into containers to take home. Its a small place, but has indoor and outdoor dining. The staff is very friendly and accommodating. My only regret is not having stayed in Aruba long enough to taste one of their pizzas. I also noticed they have a small bar. I am guessing that there is a late night crowd that comes in for a drink and pizza as a snack.